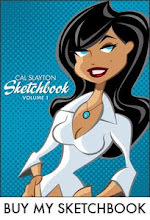 cal slayton | illustrator | graphic designer | comic book artist | dallas | dfw: "Look! Up in the sky... it's Superman!" "Look! Up in the sky... it's Superman!" 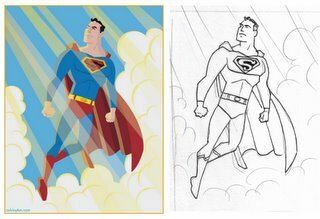 Well, I wanted to get back on the track of doing some comic book character images and I actually have an Abe Sapien in the works, but I just got a urge to do a Superman piece. So Big Blue leaped (in a single bound) ahead of my favorite fish man and came up with this one. I did the old school version of his logo, just because I dig it. I wanted him to have a majestic feel, hopefully I've accomplished that. Cool! I think the rays of sunlight look really good. Cool stuff! I definitely think the old logo helps it. The Abe Sapien piece you did is great too. Hellboy's Little Buddy - Abe Sapien! Catwoman - Julie Newmar Style! More New Artwork - Vespa Girls!